People usually build replicas of cars because the originals are so rare or so expensive they are out of reach for the average person. Taking this into consideration makes giving your Miata the face of a Z3 seem like an even worse decision. Even though this creation is currently on Ebay, we are afraid the decision to sell the Miata and buy something else (a Z3 perhaps?) came a little too late. 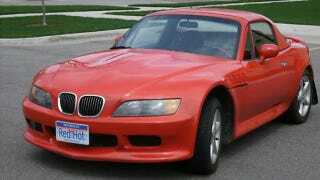 If you owned a Miata and decided you couldn't live without an affordable two seat sports car that looked like a BMW Z3, what would you do? Replace the Miata with a similarly priced used M3 might be the right answer, but as you can see, it's not the answer at least one Mazda owner came up with. What you see here is the result of mixing a Miata with a "Viper Red Metallic" paint job, a "Z3 Bodykit" and a whole lot of bad decisions. The resulting vehicle is an identity crisis on wheels that is sure to fool many people into thinking you own a used Z3, at least until they get close to it. Between the one line Ebay description and the "genius" of this concept, we are amazed to tell you that no one has placed a $4200 opening bid on this confused Miata. A not so exhaustive Ebay search revealed a high mileage example of the genuine article could be had for only $795 more than this "M3 replica" making the purchase of this modified Miata a head scratching proposition at best.